The Royal National Theatre in London, commonly known as the National Theatre (NT), is one of the United Kingdom's three most prominent publicly funded performing arts venues, alongside the Royal Shakespeare Company and the Royal Opera House. Internationally, it is known as the National Theatre of Great Britain. From its foundation in 1963 until 1976, the company was based at The Old Vic theatre in Waterloo. The current building is located next to the Thames in the South Bank area of central London. In addition to performances at the National Theatre building, the National Theatre tours productions at theatres across the United Kingdom. Permission to add the "Royal" prefix to the name of the theatre was given in 1988, but the full title is rarely used. The theatre presents a varied programme, including Shakespeare, other international classic drama, and new plays by contemporary playwrights. Each auditorium in the theatre can run up to three shows in repertoire, thus further widening the number of plays which can be put on during any one season. In June 2009, the theatre began National Theatre Live (NT Live), a programme of simulcasts of live productions to cinemas, first in the United Kingdom and then internationally. The programme began with a production of Phèdre, starring Helen Mirren, which was screened live in 70 cinemas across the UK. NT Live productions have since been broadcast to over 2,500 venues in 60 countries around the world. The NT had an annual turnover of approximately £105 million in 2015–16, of which earned income made up 75% (58% from ticket sales, 5% from NT Live and Digital, and 12% from commercial revenue such as in the restaurants, bookshops, etc.). Support from Arts Council England provided 17% of income, 1% from Learning and Participation activity, and the remaining 9% came from a mixture of companies, individuals, trusts and foundations. In 1847, a critic using the pseudonym Dramaticus published a pamphlet describing the parlous state of British theatre. Production of serious plays was restricted to the patent theatres, and new plays were subjected to censorship by the Lord Chamberlain's Office. At the same time, there was a burgeoning theatre sector featuring a diet of low melodrama and musical burlesque; but critics described British theatre as driven by commercialism and a 'star' system. There was a demand to commemorate serious theatre, with the "Shakespeare Committee" purchasing the playwright's birthplace for the nation demonstrating a recognition of the importance of 'serious drama'. The following year saw more pamphlets on a demand for a National Theatre from London publisher Effingham William Wilson. The situation continued, with a renewed call every decade for a National Theatre. Attention was aroused in 1879 when the Comédie-Française took a residency at the Gaiety Theatre, described in The Times as representing "the highest aristocracy of the theatre". The principal demands now coalesced around: a structure in the capital that would present "exemplary theatre"; that would form a permanent memorial to Shakespeare; a supported company that would represent the best of British acting; and a theatre school. The Shakespeare Memorial Theatre was opened in Stratford upon Avon on 23 April 1879, with the New Shakespeare Company (now the Royal Shakespeare Company); and Herbert Beerbohm Tree founded an Academy of Dramatic Art at Her Majesty's Theatre in 1904. This still left the capital without a national theatre. A London Shakespeare League was founded in 1902 to develop a Shakespeare National Theatre and – with the impending tri-centenary in 1916 of his death – in 1913 purchased land for a theatre in Bloomsbury. This work was interrupted by World War I. In 1910, George Bernard Shaw wrote a short comedy, The Dark Lady of the Sonnets, in which Shakespeare himself attempts to persuade Elizabeth I of the necessity of building a National Theatre to stage his plays. The play was part of the long-term campaign to build a National Theatre. Finally, in 1948, the London County Council presented a site close to the Royal Festival Hall for the purpose, and a "National Theatre Act", offering financial support, was passed by Parliament in 1949. Ten years after the foundation stone had been laid in 1951, the Government declared that the nation could not afford a National Theatre; in response the LCC offered to waive any rent and pay half the construction costs. Still, the Government tried to apply unacceptable conditions to save money; attempting to force the amalgamation of the existing publicly supported companies: the RSC, Sadler's Wells and Old Vic. Following some initial inspirational steps taken with the opening of the Chichester Festival Theatre in Chichester June 1962, the developments in London proceeded. In July 1962, with agreements finally reached, a board was set up to supervise construction, and a separate board was constituted to run a National Theatre Company and lease the Old Vic theatre. The "National Theatre Company" opened on 22 October 1963 with Hamlet. The current building was designed by architects Sir Denys Lasdun and Peter Softley and structural engineers Flint & Neill and contains three stages, which opened individually between 1976 and 1977. The construction work was carried out by Sir Robert McAlpine. The Company remained at the Old Vic until 1977, when construction of the Olivier was complete. The National Theatre building houses three separate theatres. Additionally, a temporary structure was added in April 2013 and closed in May 2016. Named after the theatre's first artistic director, Laurence Olivier, this is the main auditorium, modelled on the ancient Greek theatre at Epidaurus; it has an open stage and a fan-shaped audience seating area for 1100 people. A 'drum revolve' (a five-storey revolving stage section) extends eight metres beneath the stage and is operated by a single staff member. The drum has two rim revolves and two platforms, each of which can carry ten tonnes, facilitating dramatic and fluid scenery changes. Its design ensures that the audience's view is not blocked from any seat, and that the audience is fully visible to actors from the stage's centre. Designed in the 1970s and a prototype of current technology, the drum revolve and a multiple 'sky hook' flying system were initially very controversial and required ten years to commission, but seem to have fulfilled the objective of functionality with high productivity. Named after Oliver Lyttelton, the National Theatre's first board chairman, it has a proscenium arch design and can accommodate an audience of 890. Named after Lloyd Dorfman (philanthropist and chairman of Travelex Group), the Dorfman is "the smallest, the barest and the most potentially flexible of the National Theatre houses . . . a dark-walled room" with an audience capacity of 400. It was formerly known as the Cottesloe (named after Lord Cottesloe, chairman of the South Bank Theatre board), a name which ceased to be used with the theatre's closure under the National's NT Future redevelopment. The enhanced theatre reopened in September 2014 under its new name. The Temporary Theatre, formerly called The Shed, was a 225-seat black box theatre which opened in April 2009 and celebrated new works with its new features. The theatre closed in May 2016. In 2015 British artist Carl Randall painted a portrait of actress Katie Leung standing in front of The Shed as part of the artist's 'London Portraits' series, where he asked various cultural figures to choose a place in London for the backdrop of their portraits. Leung explained she chose The Shed as her backdrop because she performed there in the 2013 play The World of Extreme Happiness, and also because "... its a temporary theatre, it's not permanent, and I wanted to make it permanent in the portrait". The style of the National Theatre building was described by Mark Girouard as "an aesthetic of broken forms" at the time of opening. Architectural opinion was split at the time of construction. Even enthusiastic advocates of the Modern Movement such as Sir Nikolaus Pevsner have found the Béton brut concrete both inside and out overbearing. Most notoriously, Prince Charles described the building in 1988 as "a clever way of building a nuclear power station in the middle of London without anyone objecting". Sir John Betjeman, however, a man not noted for his enthusiasm for brutalist architecture, was effusive in his praise and wrote to Lasdun stating that he "gasped with delight at the cube of your theatre in the pale blue sky and a glimpse of St. Paul's to the south of it. It is a lovely work and so good from so many angles...it has that inevitable and finished look that great work does." Despite the controversy, the theatre has been a Grade II* listed building since 1994. Although the theatre is often cited as an archetype of Brutalist architecture in England, since Lasdun's death the building has been re-evaluated as having closer links to the work of Le Corbusier, rather than contemporary monumental 1960s buildings such as those of Paul Rudolph. The carefully refined balance between horizontal and vertical elements in Lasdun's building has been contrasted favourably with the lumpiness of neighbouring buildings such as the Hayward Gallery and Queen Elizabeth Hall. 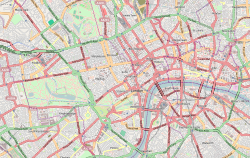 It is now in the unusual situation of having appeared simultaneously in the top ten "most popular" and "most hated" London buildings in opinion surveys. A recent lighting scheme illuminating the exterior of the building, in particular the fly towers, has proved very popular, and is one of several positive artistic responses to the building. A key intended viewing axis is from Waterloo Bridge at 45 degrees head on to the fly tower of the Olivier Theatre (the largest and highest element of the building) and the steps from ground level. This view is largely obscured now by mature trees along the riverside walk but it can be seen in a more limited way at ground level. 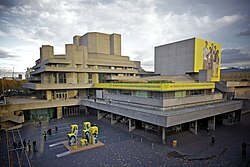 The National Theatre's foyers are open to the public, with a large theatrical bookshop, restaurants, bars and exhibition spaces.The terraces and foyers of the theatre complex have also been used for ad hoc experimental performances. The riverside forecourt of the theatre is used for regular open-air performances in the summer months. The Clore Learning Centre is a new dedicated space for Learning at the National Theatre. Offering events and courses for all ages, exploring theatre-making from playwriting to technical skills, often led by the NT's own artists and staff. The dressing rooms for all actors are arranged around an internal lightwell and airshaft and so their windows each face each other. This arrangement has led to a tradition whereby on the opening night (known as 'press night') and closing night of any individual play, when called to go to 'beginners' (opening positions), the actors will go to the window and drum on the glass with the palms of their hands. Backstage tours run throughout the day and the Sherling High Level Walkway, open daily until 7.30 pm, offers visitors views into the backstage production workshops for set construction and assembly, scenic painting and prop-making. 2013 saw the commencement of the 'NT Future' project; a redevelopment of the National Theatre complex which it was estimated would cost about £80m. The Studio building across the road from the Old Vic on The Cut in Waterloo. The Studio used to house the NT’s workshops, but became the National's research and development wing in 1984. The Studio building houses the New Work Department, the Archive, and the NT's Immersive Storytelling Studio. The Studio is a Grade II listed building designed by architects Lyons Israel Ellis.Completed in 1958, the building was refurbished by architects Haworth Tompkins and reopened in autumn 2007. The National Theatre Studio was founded in 1985 under the directorship of Peter Gill, who ran it until 1990. Laura Collier became Head of the Studio in November 2011, replacing Purni Morrell who headed the Studio from 2006. Following the merge of the Studio and the Literary Department under the leadership of Rufus Norris, Emily McLaughlin became the Head of New Work in 2015. National Theatre Live is an initiative which broadcasts performances of their productions (and from other theatres) to cinemas and arts centres around the world. It began in June 2009. The third season of broadcasts launched on 15 September 2011 with One Man, Two Guvnors with James Corden. This was followed by Arnold Wesker's The Kitchen. The final broadcast of 2011 was John Hodge's Collaborators with Simon Russell Beale. In 2012 Nicholas Wright's play Travelling Light was broadcast on 9 February, followed by The Comedy of Errors with Lenny Henry on 1 March and She Stoops to Conquer with Katherine Kelly, Steve Pemberton and Sophie Thompson on 29 March. One Man, Two Guvnors returned to cinema screens in the United States, Canada and Australia for a limited season in Spring 2012. Danny Boyle's Frankenstein also returned to cinema screens worldwide for a limited season in June and July 2012. The fourth season of broadcasts commenced on Thursday 6 September 2012 with The Curious Incident of the Dog in the Night-Time, a play based on the international best-selling novel by Mark Haddon. This was followed by The Last of the Haussmans, a new play by Stephen Beresford starring Julie Walters, Rory Kinnear and Helen McCrory on 11 October 2012. William Shakespeare's Timon of Athens followed on 1 November 2012 starring Simon Russell Beale as Timon. On 17 January 2013, NT Live broadcast Arthur Wing Pinero's The Magistrate, with John Lithgow. The performances to be filmed and broadcast are nominated in advance, allowing planned movement of cameras with greater freedom in the auditorium. Connections is the annual nationwide youth theatre festival run by the National Theatre. The festival was founded in 1995, and features ten new plays for young people written by leading playwrights. Productions are staged by schools and youth groups at their schools and community centres, and at local professional theatre hubs. One of the productions of each play is invited to perform in a final festival at the National Theatre, usually in the Olivier Theatre and Dorfman Theatre. On Demand. In Schools is the National Theatre's free production streaming service for UK schools. The service is designed for use by teachers in the classroom, and features recordings of curriculum-linked productions filmed in high definition in front of a live audience. The service was launched initially to UK secondary schools in 2015 with productions for Key Stage 3 pupils and above. In November 2016, the National Theatre launched to service to UK primary schools, adding a number of new titles for Key Stage 2. Productions currently offered by the service include Frankenstein (directed by Danny Boyle, starring Benedict Cumberbatch and Jonny Lee Miller), Othello (directed by Nicholas Hytner, starting Adrian Lester and Rory Kinnear), Antigone (directed by Polly Findlay, starring Christopher Eccleston and Jodie Whittaker), and Jane Eyre (directed by Sally Cookson). In 2018, the National Theatre reported that over half of UK state secondary schools have registered to use the service. On Demand. In Schools won the 2018 Bett Award for Free Digital Content or Open Educational Resources. River Stage is the National Theatre's free outdoor summer festival takes place over five weekends outside the National Theatre in its North East Corner Square. It is accompanied by a number of additional street food stalls and bars run by the NT. The event features programmes developed by various companies for the first four weekends, programming the fifth itself. Takeover organisations have included The Glory, HOME Manchester, Sadler's Wells, nonclassical, WOMAD, Latitude Festival, Bristol's Mayfest, and Rambert. The festival launched in 2015 and is produced by Fran Miller. The annual "Watch This Space" festival was a free summer-long celebration of outdoor theatre, circus and dance, which was replaced in 2015 by the River Stage festival. "Watch This Space" featured events for all ages, including workshops and classes for children and adults. "Watch This Space" had a strong national and international relationships with leading and emerging companies working in many different aspects of the outdoor arts sector. Significant collaborators and regular visitors included Teatr Biuro Podrozy, The Whalley Range All Stars, Home Live Art, Addictive TV, Men in Coats, Upswing, Circus Space, Les Grooms, StopGAP Dance Theatre, metro-boulot-dodo, Avanti Display, The Gandinis, Abigail Collins, The World Famous, Ida Barr (Christopher Green), Motionhouse, Mat Ricardo, The Insect Circus, Bängditos Theater, Mimbre, Company FZ, WildWorks, Bash Street Theatre, Markeline, The Chipolatas, The Caravan Gallery, Sienta la Cabeza, Theatre Tuig, Producciones Imperdibles and Mario Queen of the Circus. The festival was set up by its first producer Jonathan Holloway, who was succeeded in 2005 by Angus MacKechnie. Whilst the Theatre Square space is occupied by the Temporary Theatre during the NT Future redevelopment, the "Watch This Space" festival was suspended. In 2013 the National announced that there would be a small summer festival entitled 'August Outdoors' in Theatre Square. Playing Fridays and Saturdays only, the programme included The Sneakers and The Streetlights by Half Human Theatre, The Thinker by Stuff & Things, H2H by Joli Vyann, Screeving by Urban Canvas, Pigeon Poo People by The Natural Theatre Company, Capses by Laitrum, Bang On!, Caravania! by The Bone Ensemble, The Hot Potato Syncopators, Total Eclipse of the Head by Ella Good and Nicki Kent, The Caravan Gallery, Curious Curios by Kazzum Theatre and The Preeners by Canopy. 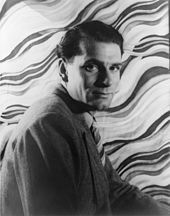 Laurence Olivier became artistic director of the National Theatre at its formation in 1963. He was considered the foremost British film and stage actor of the period, and became the first director of the Chichester Festival Theatre – there forming the company that would unite with the Old Vic Company to form the National Theatre Company. In addition to directing, he continued to appear in many successful productions. He became a life peer in 1970, for his services to theatre, and retired in 1973. Peter Hall took over, to manage the move to the South Bank. His career included running the Arts Theatre between 1956 and 1959 – where he directed the English language première of Samuel Beckett's Waiting for Godot. He went on to take over the Memorial Theatre at Stratford, and to create the permanent Royal Shakespeare Company, in 1960, also establishing a new RSC base at the Aldwych Theatre for transfers to the West End. He was artistic director at the National Theatre between 1973 and 1988; and continued to direct major performances for both the National and the RSC as well as running his own company at The Old Vic and summer seasons at the Theatre Royal, Bath. In 2008, he opened a new theatre, The Rose, and remains its director emeritus. One of the National's associate directors, Richard Eyre became artistic director in 1988; his experience included running the Royal Lyceum Theatre, Edinburgh and the Nottingham Playhouse. He was noted for his series of collaborations with David Hare on the state of contemporary Britain. In 1997, Trevor Nunn became artistic director. He came to the National from the RSC, having undertaken a major expansion of the company into the Swan, The Other Place and the Barbican Theatres. He brought a more populist style to the National, introducing musical theatre to the repertoire. In April 2003, Nicholas Hytner took over as Artistic Director. He previously worked as an associate director with the Royal Exchange Theatre and the National. A number of his successful productions have been made into films. In April 2013 Hytner announced he would step down as artistic director at the end of March 2015. Amongst Hytner's innovations were NT Future, the National Theatre Live initiative of simulcasting live productions, and the Entry Pass scheme, allowing young people under the age of 26 to purchase tickets for £7.50 to any production at the theatre. Rufus Norris took over as Artistic Director in March 2015. He is the first person since Laurence Olivier to hold the post without being a University of Cambridge graduate. Facing east; towards the City of London, from Waterloo Bridge. Showing St. Paul's, and other major City buildings – to the right, the illuminated National Theatre. In 1962, the company of The Old Vic theatre was dissolved, and reconstituted as the "National Theatre Company" opening on 22 October 1963 with Hamlet. The company remained based in The Old Vic until the new buildings opened in February 1976. The Recruiting Officer, directed by William Gaskill with Laurence Olivier as Captain Brazen, Maggie Smith as Sylvia and Robert Stephens as Captain Plume (1963). The Curious Incident of the Dog in the Night-Time by Simon Stephens, adapted from the novel of the same name by Mark Haddon, with Luke Treadaway, Nicola Walker and Niamh Cusack (2012). The ensemble shows a varying range of geometric relationships. ^ Lister, David (11 January 2003). "Wales and Scotland need a cultural revolution". The Independent. London. ^ "National Theatre Near You". Royal National Theatre. Archived from the original on 3 February 2015. Retrieved 20 January 2015. ^ Woodfield, James (1984). English Theatre in Transition, 1881–1914: 1881–1914. Rowman & Littlefield. pp. 95–107. ISBN 0-389-20483-8. ^ a b c Findlater, Richard The Winding Road to King's Reach (1977), also in Callow. Retrieved 1 July 2008. ^ "Denys Lasdun and Peter Hall talk about the building". History of the NT. Royal National Theatre. Archived from the original on 22 July 2010. Retrieved 1 October 2009. ^ "A portrait of achievement" (PDF). Sir Robert McAlpine. Archived from the original (PDF) on 8 May 2016. Retrieved 24 April 2016. ^ Brown, Mark "National Theatre's Cottesloe venue to be renamed after £10m donor" The Guardian, 28 October 2010. Retrieved 5 December 2010. ^ "Temporary Theatre". Royal National Theatre. ^ "National Theatre reveals closing date for Temporary Theatre". The Stage. 19 April 2016. ^ Pearman, Hugh (21 January 2001). "Gabion: The legacy of Lasdun 2/2". Archived from the original on 5 March 2012. Retrieved 25 April 2008. ^ Historic England. "Royal National Theatre (1272324)". National Heritage List for England. Retrieved 16 August 2018. ^ Rykwert, Joseph (12 January 2001). "Sir Denys Lasdun obituary". The Independent. London. Archived from the original on 30 September 2007. Retrieved 22 January 2007. ^ Lithgow, John (13 January 2013). "A Lone Yank Takes Joy in Togetherness". The New York Times. p. AR7. Retrieved 16 May 2013. ^ "Welcome to National Theatre NT Future", Royal National Theatre. Retrieved 6 April 2013. ^ Historic England. "Royal National Theatre Studio (1391540)". National Heritage List for England. Retrieved 18 December 2018. ^ Cavendish, Dominic (28 November 2007). "National Theatre Studio: More power to theatre's engine room – Telegraph". The Daily Telegraph. London. Retrieved 25 April 2008. ^ "Collier to Head NT Studio" Archived 12 November 2012 at the Wayback Machine, The British Theatre Guide, 20 October 2011. Retrieved 6 April 2013. ^ The Magistrate Archived 7 September 2012 at the Wayback Machine. Royal National Theatre. ^ "National Theatre On demand. In Schools". schools.nationaltheatre.org.uk. Retrieved 15 August 2018. ^ "Third of secondary schools sign up to National Theatre's streaming service | News | The Stage". The Stage. 4 November 2016. Retrieved 15 August 2018. ^ "2018 winners | Bett Awards". bettawards.com. Retrieved 15 August 2018. ^ "Watch this Space presents August Outdoors". Royal National Theatre. Archived from the original on 5 August 2013. ^ Charlotte Higgins, "Sir Nicholas Hytner to step down as National Theatre artistic director", The Guardian, 10 April 2013. Retrieved 6 May 2013. ^ "Sir Nicholas Hytner to leave National Theatre", BBC News, 10 April 2013. Retrieved 6 May 2013. ^ ''One Man, Two Guvnors'' Archived 8 June 2012 at the Wayback Machine. Onemantwoguvnors.com. ^ ''The Curious Incident of the Dog in the Night-Time'' Archived 23 July 2012 at the Wayback Machine. Royal National Theatre. ^ ''King Lear'' Archived 20 May 2014 at Archive.today. Royal National Theatre. ^ McPhee, Ryan. "War Horse Will Return to London's National Theatre; Additional Season Casting Set | Playbill". Playbill. Retrieved 21 February 2018. ^ Wood, Alex (21 March 2018). "National Theatre and The Wardrobe Ensemble to present The Star Seekers at the Dorfman Theatre". WhatsOnStage.com. Retrieved 23 April 2018. ^ Paulson, Michael (19 April 2018). "The Underworld Will Stop in London en Route to Broadway". The New York Times. ISSN 0362-4331. Retrieved 23 April 2018. Hall, Peter, (edited Goodwin, John) (1983): Peter Hall's Diaries: The Story of a Dramatic Battle (1972–79). Hamish Hamilton, London. ISBN 0-241-11047-5. Callow, Simon (1997): The National: The Theatre and its Work, 1963–1997. Nick Hern Books, London. ISBN 1-85459-318-8. Wikimedia Commons has media related to National Theatre, London.